Domestic & Commercial Window Cleaning Greater Manchester M1 | Quality Property Care Ltd.
Meet the innovative commercial and residential professional window cleaning! See how quick it is to have your windows sparky clean. Get some rest, while the well-trained and experienced window cleaners show their very best in your property. Get in touch with us on 0161 823 0325 to book more comprehensive info about our best and hassle-free services. The expert services offered by Quality Property Care Ltd. are licensed and approved by a number of agencies and institutions, and are suggested both as a domestic windows cleaning service and commercial window cleaning service. 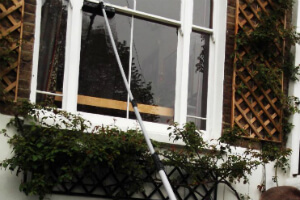 The windows on all kind of domestic properties and commercial properties can be cleaned, if they are reachable. For higher floors the enterprise will deliver a well-equipped and skilled rope access window cleaning staff.You can request sticker removal as well. The only demand for the windows cleaning with the support of the water fed pole, is that there is an available parking area for the firm's van at a distance of less than 30 meters from the windows. The purpose is that the tank with filtered water is in the van, and it is where the water is pumped out of. Secure rope access window cleaning, 100% danger and chemical-free cleaning! This service plan is not hourly based, meaning that you reserve us per window, we go away once you are satisfied. Maintenance on all of the windows to be cleaned must be completed in order for us to properly clean the glass, seals and frames. A minimal callout fee of 35GBP does apply, but, if you book us in advance you will have a discounted rate. You can contact us for a same-day cleaning, during bank holidays and weekends at no extra charge. For us to be capable to clean thoroughly there must be a crystal clear access to the windows and a parking space within 30 meters on the same side of the property as the glass windows. We are not capable to clean wooden window frames and sills with our water-fed system, or we might damage the paint and glass. We work for shops, offices, residential homes, restaurants, property managers, landlords and tenants, libraries, public buildings and a range of other customers. We are also delivering you an interior window cleaning job which can be merge arranged with the exterior window cleaning service. 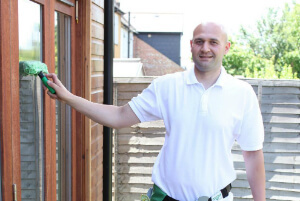 At a lower price tag you can book both and receive your home or office windows cleaned along with your gutters and conservatory roof and windows. To effectively clean inside we use a qualified grade squeegee, protective gloves, a ladder, a bucket and a special detergent mixture. The detergent is applied then left to react with any greasy or dusty stains on the inside of the window. After that it is scraped away with the squeegee leaving your windows clean. Attention: our service is hundred percent eco-friendly and streak-free! No matter your home windows, the friendly window cleaners in Greater Manchester M1 will polish them to brilliance! Do not waste time, but give us a call on 0161 823 0325! Get a free quote today! See our budget friendly price list and get a reservation for risk-free and efficient window cleaning in Greater Manchester M1 right now!